Not every week is the same. There are slow weeks and there are full weeks. This week due to the Mayoral Debate I missed my 10K FARTLEK on Tuesday. This did mean I had enough of a breather after my LSD Sunday for Thursday’s 10K Easy to be exactly that. Last week was a painful MOFO and I never felt I had recovered from Liverpool and was therefore always in some sort of leg pain. Your goals change. The initial idea for getting a coach was to prepare myself by getting someone to organise it all for me, else I would just do my half arsed attempt at training. My goal in week one was to finally feel better, as I was broken all week. My goal this week, as I felt okay coming into today, was a Park Run PB. Tomorrow I have lunch with friends, so unless I get up early it will be a slow slow slow LSD. If so I may go longer than asked. I have run over 100KM this month already and discovered a bug in Nike+, and read about nutrition and tasted Beet It beetroot juice. I am looking forward to the races at the end of the month, the British 10K and Great Newham 10K and expect great things. I am also wanting at least one PR PB this month and have no one to blame but myself if I don’t achieve it. 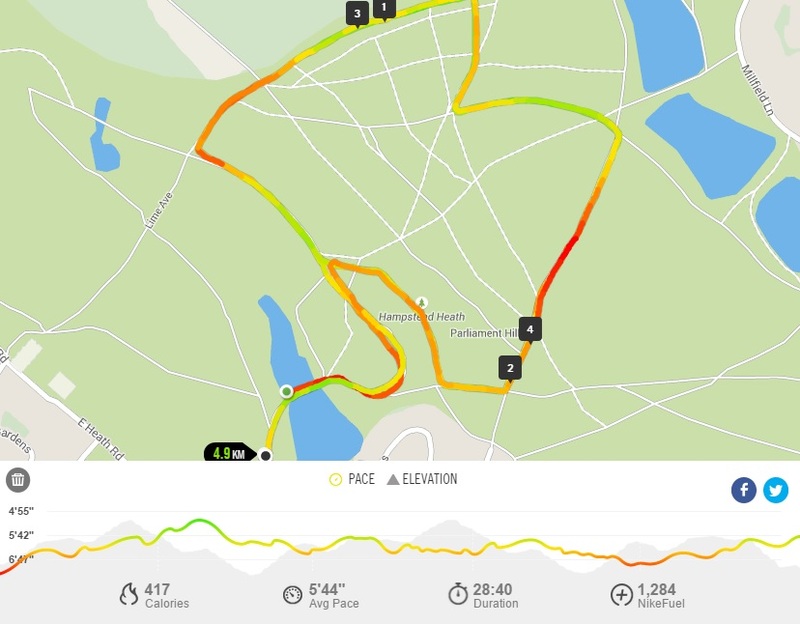 So it was a hot and hilly Park Run in Hampstead today. A 5’44” pace is ok TBH and only slower than my Westminster Mile, BUPA 10 and Eton Dorney runs, all of which I got PBs at, I could have run a lot faster but, as always ran within myself. I also started my watch early and stopped it late, so there is a chance of a PR PB. We shall have to see.